These notes were compiled by Ollie Taylor at the time of the Mock Mayor making ceremony in 2011. You can find out more by visiting Tony Ward’s page and Alan Myatt’s page. What was the origin of the tradition of the Mock Mayor of Barton? There is a general sense amongst writers that the tradition of the Mock Mayor can be traced back to the Civil War, although there are no solid accounts of this. HYJ Taylor (in John Jennings’ Gloucester Handbook) suggests that the Mock Mayors of Barton are “more ancient than the Mayors of Gloucester”, although Duart-Smith questions this (in “Mock Mayors of Barton St” written in 1923 and held at Gloucestershire Archives under the reference B636/35369). Another suggestion by HYJ Taylor is that the “Mayors” of Barton Street derived their origin from the ancient institution of the “Halmote or Halimote of Barton Street”. How was the Mock Mayor elected? To be eligible for office, it was necessary that he should be a native of Barton, or have resided in it 2 years, and that he had either “through want of judgement or absence of mind, made some blunders of an amusing nature before he could be named to the ‘Court’” – once appointed he could not shake off the “honour”. “Two brothers left alone to do the cooking. One believed in the adage that ‘too many cooks spoil the broth’ left his brother to boil the mutton and returned home to find that although the pot was boiling merrily, the mutton had not found its way into the pot”. Another, who had a large house by the Bell Inn resolved to keep some pigs to eat “the exuberant refuse of his spacious and prolific garden” and accordingly built a commodious and expensive piggery and fenced it with care. When the pigs arrived he found alas! that gateway and door had been forgotten. Another anecdote regarding a man who sowed soot on land in order to grow chimneys / chimblies is particularly amusing with dialogue recorded verbatim. Who were the Mock Mayors? A time arrived when the Mock Corporation of Barton Street “ceased to be respectable”, but it is equally beyond doubt that many men of position occupied the chair. A well known solicitor, the editor of the Gloucester Journal (Mr David Mowbray Walker), his brother, a Russian Consul, and a timber importer, are amongst those mentioned by G Armstrong Howitt (in the Gloucester Standard, c.1889 – 90), who also tells us that upon one occasion the mayor for one year was also the mayor of the city. What did the Mock Mayor do? The Mock Mayor, or the “Mayor of Bartonia”, had a “court” with a coat of “arms”. 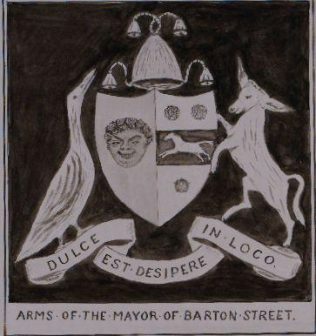 The “Mayor’s” armorial coat of arms (described on p4 of Duart-Smith and included with the papers) has the motto: “Dulce est Desipere in Loco” (It is delightful to play the fool occasionally). The armorial insignia could be seen in the 1880s in the premises of Mr Frampton the wine merchant of Bell Lane but this has since disappeared. In the case of contempt of or non-compliance with his “court”, the Mock Mayor could inflict “mock-penalties” upon his subjects (see p. 4a of Duart-Smith). The offender could be forbidden to “shoot ducks, fowls, donkeys, pigs, or any game whatever, or fish in any river, running stream, ditch, pool, or puddle, with many other pains also”. The laws of Barton Street and its Mayor were described as “more lax than those of the Medes and Persians”. HYJ Taylor believes that this court was held at the Old Vauxhall (pub?) but the last Mock “Town Hall” was located at the “Bell Inn”, Barton Street. 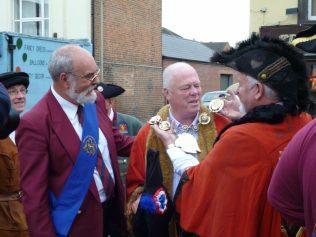 The Mock Mayor regularly visited Coopers Hill and the Cotswold Games.